The U.S. Department of Justice has announced significant progress has been made in the investigation of the threat actors behind the SamSam ransomware attacks that have plagued the healthcare industry over the past couple of years. 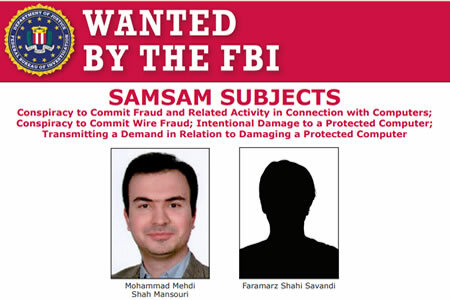 The DOJ, assisted the Royal Canadian Mounted Police, Calgary Police Service, and the UK’s National Crime Agency and West Yorkshire Police, have identified two Iranians who are believed to be behind the SamSam ransomware attacks. The DOJ reports that this is the first ever U.S. indictment against criminals over a for-profit ransomware, hacking, and extortion scheme. In contrast to many threat actors who use ransomware for extortion, the SamSam ransomware group conducts targeted, manual attacks on organizations. Most ransomware gangs use spam email and other mass distribution techniques to infect as many individuals as possible. The SamSam ransomware group exploits vulnerabilities and conducts brute force RDP attacks to gain access to systems, then investigates networks and moves laterally before manually deploying ransomware on as many computers as possible. This method of attack allows the threat actors to inflict maximum damage. With a large percentage of an organization’s computers and systems taken out of action, the gang can issue large ransom demands. The ransoms demanded are typically in the range of $5,000 to $50,000, with the amount based on the number of devices that have been encrypted. In the two years that the gang has been deploying SamSam ransomware, approximately $6,000,000 in ransom payments have been collected from around 200 victims. Many victims chose not to pay the ransom demands but still incurred significant costs mitigating the attacks. The DOJ estimates that in addition to the ransom payments, additional losses from downtime due to the attacks has exceed $30 million. The gang’s list of victims is long and includes the cities of Newark, New Jersey and Atlanta, the Colorado Department of Transportation, and the Port of San Diego. Healthcare industry victims include Hancock Health, Adams Memorial Hospital, Kansas Heart Hospital, Allied Physicians of Michiana, Cass Regional Medical Center, Nebraska Orthopedic Hospital, LabCorp of America, Allscripts, and MedStar Health. Research by Sophos indicates 26% of attacks were on the healthcare organizations, 13% were on government agencies, 11% were on educational institutions, and 50% were on private companies. The attacks have primarily been conducted on organizations in the United States, with other victims spread across Canada, the UK, and the Middle East. The DOJ will continue to work with international law enforcement agencies to gather evidence and bring those responsible to justice. The DOJ has also taken the opportunity to spread the message that all industry sectors are at risk of being attacked. “This indictment highlight[s] the need for businesses, healthcare institutions, universities, and other entities to emphasize cyber security, increase threat awareness, and harden their computer networks,” wrote the DOJ in a press release announcing the indictment.